Being a documentary wedding photographer means being in the right place at the right time sure, but it also takes more than that. You really need to show the emotion of a wedding in your photos - after all, wedding photography is all about people and people are all about emotion. This is one of my favourite documentary wedding photos from the last wedding season, and hopefully it's easy to see why. The groom can be seen centre, with his best man and usher standing either side. This image shows the exact moment that the groom saw the bride walking down the aisle for the first time, and the look on his face shows you everything you need to know about this moment. 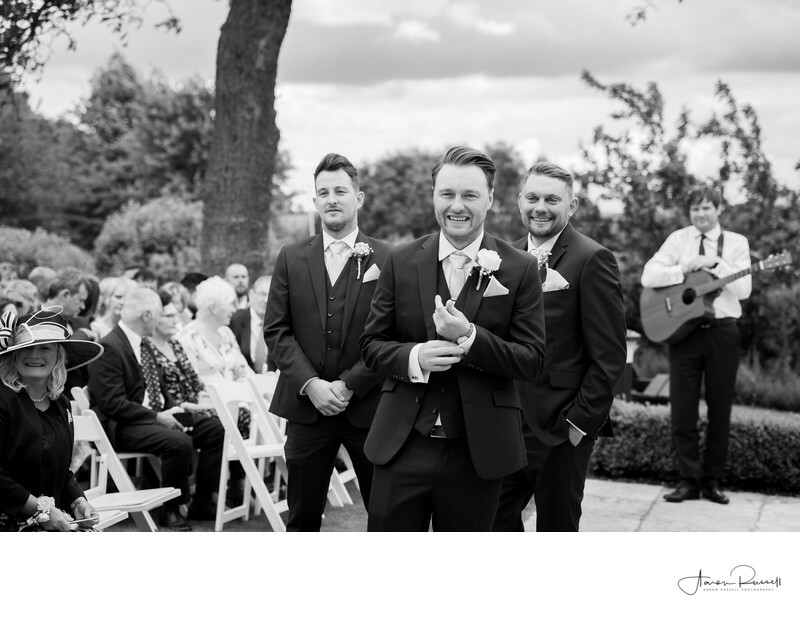 I also love the look on the faces of his groomsmen too, as well as the guitarist, awaiting his cue to start playing in the background. For this type of photography I like using a long telephoto lens and keeping my distance as best I can. This allows things to play out naturally, meaning you get the most authentic story of your wedding day, told solely in photos. With photos like this, the longer you look at them, the more details become apparent.